Newcastle fans saw what we hope is the real Salomon Rondon today as he scored two good goals in the first half and had chances to make it a hat-trick in the second half. Now we can understand why Salomon was Rafa’s number one transfer target last summer. It’s just a pity we could not have got him in a couple of months earlier had owner Mike Ashley been willing the £16.5M in his relegation release clause at West Brom. 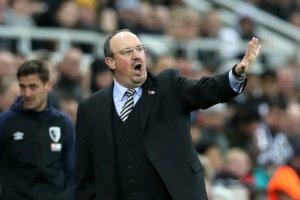 We wonder how many points that has cost Newcastle this season – the Newcastle hierarchy knows nothing about football – they have proved that so many times before. So they need to start listening to Rafa who wanted Rondon in much earlier than when he finally arrived in the final week of the window and he was not fit. Bottom line today – a second great win in a row. Who Was Newcastle's Best Player Against Bournemouth? Previous Post Who Was Newcastle's Man Of The Match In 2-1 Win Over Bournemouth? Got to be in with a chance for goal of the season. Great win and a breath of fresh air not to have the usual idiots on wasting good oxygen. It’s good to debate this type thing rather than discussing defeats. Another good weekend and more importantly a good way to go into international break!! that Muto’s calf injury was minor. No kidding hes not fit. A gastric band wouldn’t go amiss. He did have a cracking game though. I won’t begrudge him a trip to greggs tonight, but still think he ought to stop dodging the salad. Did anyone catch that ball by Perez to kenedy in first half? What a ball, weight, pace and timing absolutely spot on. Kenedy one two, just didn’t get quite enough on the ball to put past keeper. could make a cracking Rugby flanker. As a former Union blindside flanker I can assure you I don’t need Sherlock Holmes to provide the words ‘Fact Hunt’. He was angry but what he showed more than anything was the red mist didn’t take over, cook had no intention of playing the ball and just hacked him down. Mitro would have got sent off in the same situ. Yes it’s defo moved on, apart from certain areas in Japan where the Atom bomb still has an impact on people. The ref was already going in his pocket Our Toon, but Rondon got in his face, and if Cook milked that, as we have seen many a footballer over the years, he could have risked a red. I agree a player needs some fire in the belly, but that was just unneeded. I suppose that Hayden did buoy up the defence but I don’t remember him actually doing anything, anyone else think that? G, he doesn’t waste that weight though matey, he was bouncing their defenders all over the park. Aye, he could lose a few pounds but he’s just naturally a big bloke. He can carry that weight which is what matters. For a big bloke he’s not exactly slow over twenty yards. Granted he tired, but he’s not fit yet mate and when he is we’ve got a real player. Old fashioned centre forward. Nothing was going to stop him getting on the end of that cross for sure. I Really wanted him to get his hattrick and he came close. When he’s a bit fitter with an extra yard of pace he will cause problems for any defence. I can see him and Muto striking up a real positive partnership, because Muto never stops running and will get on those flicks better than Perez does. Schar and Fernandez will keep Lascelles out if they carry on like this. Our centre back options must be amongst the best in the league. Four real quality players in Lascelles, Lejeune, Fernandez and Schar, perm any two from four and you can’t go wrong. Dummett another solid display and Ki creative again. Like to see Ki and Shelvey when fit at home, maybe 433 with Diame? Or just the two of them together might work. Plenty of positives from today chaps, only Ritchie worrying me personally. He leaves Yedders exposed far too often but they can work on that I’m sure. Maybe bring Murphy in if Ritchie can’t cover better? Nice little cameo from Atsu today. Looked more like he has done in the past and nearly capped it with a goal. He’s not been the same player since his operation but these things take time. All in all I reckon a decent 7.5/10 today for giving it 100% and beating what is, in all fairness, a very good Bournemouth side. I actually fancy three in a row at Burnley after the horribly annoying international break. (Or is it just me?) Go away, come back injury free and onwards and upwards. Good result. When rafa gets the counter attacking pace on the right wing and up front and possibly in the middle we will be an awkward team to beat. Another battling performance not pretty at times but we never gave in. Started off well but could of been behind first minute for not a brilliant challenge from Ferdanez who had another excellent gam. Second like a cup tie first half hour both teams attacking going for a extra goal until we seemed to run out of steam and were pegged back. Bournemouth cam a bit one dimensional at the end tho with balls into the box and pity Rondon did not get his hat-trick at the end with a quick counter attack. Somehow we have got to sort out the Yedlin Ritchie partnership on our right as time and time again we gave so much space to the opposition which teams are now targeting. Dummett 7 – much underrated by a lot of people – was excellent today – nowt got past him all game. Fernandez 8 – Another great match bossed it all game and put in a couple of goal saving tackles – proving a bargain – good on the ball. Schar 7 – excellent all-round game and some beautiful balls out of defence likes to carry the ball and pass – great to see. Yedlin 6.5 great run and pass for first goal and going forward but with Ritchie left with far to much to do and gives the opposition winger far to much space. Diame 7 – getting better game by game great chip ball for Yedlin run onto and cross for first goal. did his job of breaking up opposition play and given but tends to foul to many times. Kenedy 8 – another excellent game getting better as season goes on ran himself into the ground and brilliant ball for Rondon’s header. Ki 8 – started the move for first goal with delightful cross field ball to Kenedy – ran himself into the ground – covered every inch of the pitch. Perez 7 – never stops working but did n’t look like scoring tho should of done better with the chance he had end of first half. Rondon 9.5 – ad I said like a First world war Tank last week one Gera slow turning – BUT this week the Tank found its gears its gun and movement a all-round old fashioned centre forwards display held play up up front hard to knock of the ball ran all game capped it off with two goals – would of given him 10 had he scored his hat-trick. Rafa 8 subs spot on did not have much to go with and could of brought any of half a dozen off as some were running on empty at the end. Didn’t I read that Muto’s wife is about to give birth, hence he’s back in Japan? There’s one thing for sure, that ‘daft passing thought’ wouldn’t have been alone! You must have more than than anyone! And, speaking of daft passing thoughts and assuming,Ashley was at the match, I wonder if he congratulated Rafa on signing Rondon, a player too old for Ashley’s preferred profile? For some reason, I can’t see humble pie being one of Ashley’s favourite dishes. A bit like allasane plea who scored a hatrick today. Stick him in today’s performance and Bournemouth could have been hit for 4/5 with their high line. When I said that, what I really meant was for bloggers who have an opinion that matters. I should have specified that. Got to say, I have absolutely rated yedlin this season. Made errors but every full back will get beat at some point in the game. He really is turning in to a fine full back. Just got back in and a little worse for it…..
For those knockers about Woe Rafa…..Have another look. G, you want a goal’s grace as they’re at home mate, then take it on. 🙂 Good bet if he’ll give you that goal Freeby. You can return it in the second game and win twice mate. Surely he’ll agree to that? Let’s be honest, home team advantage shouldn’t result in the same odds. They’re at home, he should happily give you one head start then you do the same up here. Contrary to most posts during the match which only criticised him, Perez was probably our most creative player on the day. Put Kenedy in with a sublime 1-2 for our best chance aside from the 2 goals. Picked out Ritchie early in the 2nd half who shot wide from penalty spot under pressure. Released Kenedy for a counter which he messed up by taking a heavy touch when faced with the last man. His close control and ball retention was much better today too, his pass selection and execution was good all game – the 1-2 with Ki in the 2nd half and then setting Ritchie away who crossed for Rondon was a really nice bit of play, shame Rondon didn’t connect like he did with his first header as it would’ve been a great team goal. Lots of fluid attacks on the whole today. Encouraging. Great result, it was 1-0 when I went back out to graft, couldn’t listen to the second half either so looking forward to .co.uk highlights on Monday, unless anyone has got a link to a couple of minutes worth now. So Rondon is just the striker we’re looking for, what a shame his price will go up around 7M pounds if he does well this season, leaving Mikey having to pay 23M+ for a 30 year old stiker. Has grown this season has yedlin, proper modern day attacking fullback, more of a threat down the right than Ritchie is. The issue he has is that defensively I don’t think Ritchie offers him enough in way of support. At least it seems that way, I’d have a better idea if I went back to being a season ticket holder though as the view can be distorted on the telly. Bobby, I’m tempted mate. But Xmas is looming, kids want the latest Nintendostationbox one each, and the missus wants perfume which costs more than fresh unicorn steaks. I’m genuinely torn on this one.